Department of Chemical Engineering researcher Dr Monica Gumulya studied the hydrodynamics of liquid droplet evaporation on heated, solid spherical particles. "How fast evaporation occurs [at high temperatures] is not actually known, and what parameters influence that are not known," Dr Gumulya says. 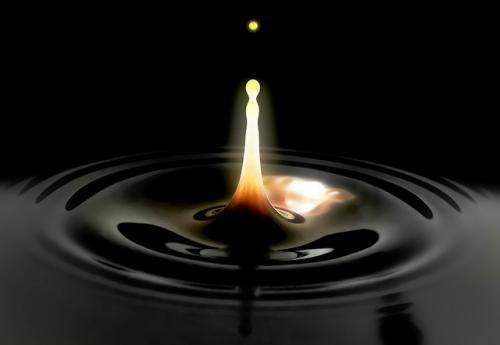 Oil is classified as heavy or light depending on its density compared to water. Heavy oils have longer-chained molecules and are more difficult to process. However, light, easier to process petroleum is becoming scarce, and there is an increasing need to process heavy oil. Heavy crude oil is refined by a process called fluid catalytic cracking (FCC). The central aspect of FCC is the interaction of superheated solid particles with droplets of heavy oil to vapourise or evaporate them, this cracks the long-chained oil molecules, converting them to products we use every day, such as kerosene and gasoline. The study looked at two parameters, liquid droplet size and velocity, to determine optimal ranges for evaporation to occur. Dr Gumulya's findings were contrary to intuition; reduced contact time between the superheated solid particle and the liquid droplets increased evaporation, and excessively small liquid droplets actually evaporated slower than larger droplets. "In some cases, smaller droplets formed a stable vapour layer, which stops contact between the droplet and the particle." She found larger liquid droplets were able to displace the vapour layer, coming into contact with the heated particle, allowing evaporation to occur. Velocity also plays an important part in evaporation. Faster moving particles, even though they had less contact time with the solid particle, evaporated faster because more mixing and heat transfer was occurring within the droplet, Dr Gumulya says. This kind of numerical modelling is made possible now due to the existence and accessibility of supercomputers and high speed cameras, she says. Numerical studies of this nature are very hard, she says. "One [simulation] requires a few days per run using parallel computers. It's really quite an intensive process," she says. Each simulations takes five days to process using 144 parallel Intel Xeon 2.8 GHz processors at iVEC's facilities at Murdoch University. Dr Gumulya ran dozens of simulations. More information: Monica Gumulya, Ranjeet P. Utikar, Vishnu Pareek, Ryan Mead-Hunter, Subhasish Mitra, Geoffrey M. Evans, "Evaporation of a droplet on a heated spherical particle," Chemical Engineering Journal, Available online 8 November 2014, ISSN 1385-8947, dx.doi.org/10.1016/j.cej.2014.11.024.